Will he take up the challenge? A 12-year-old animal rights and climate campaigner made an offer Wednesday Pope Francis may find hard to refuse: eat vegan during Lent and a $1 million will go to a charity of the Pontiff's choice. "Your Holiness, we must act," Genesis Butler, already a veteran activist when she gave her first TedX talk at the age of 10, said in an open letter supported by former Beatle Paul McCartney, film legend Brigitte Bardot, and dozens of minor celebrities. "Moving towards a plant-based diet will protect our land, trees, oceans and air, and help feed the world's most vulnerable." "Today, Pope Francis, I am asking you to join me in abstaining from all animal products throughout Lent," the 40 days of penance and fasting before Easter Sunday observed by Catholics, Anglicans and Orthodox Christians. Butler's letter reflects three social movements that have converged into an increasingly insistent call to eat less or no meat. Climate scientists have shown that the way food is currently produced, distributed and consumed worldwide generates 25 to 30 percent of planet-warming greenhouse gas emissions. Cattle production alone accounts for more than half of those gases, in the form of methane-laden flatulence, and carbon dioxide released when forests - especially in the tropics - are cleared to make room for livestock. While the Pope is known to live a frugal lifestyle, his meat-loving homeland Argentina is the world's second-biggest consumer of beef per capita. A major study last month calculated that only a stringent plant-based diet - with vastly reduced meat portions compared to current levels of consumption, especially in rich nations - can feed the 10 billion people projected to inhabit the planet in 2050 without wrecking the environment. "With 815 million people suffering from malnutrition, imagine how many hungry people we could feed across the world if we moved away from such wasteful diets," Butler said in the letter, written jointly with the Million Dollar Vegan non-profit campaign. At age eight, the young Californian joined the ranks of animal welfare advocates, most of whom foreswear meat or meat products. Vegans take things a step further, avoiding dairy, eggs or any other foods that, they say, may entail animal suffering. Finally, the campaign highlights the health benefits of a diet based mainly on veggies, fruits, grains, legumes and nuts. A global epidemic of obesity - with some two billion people eating too much of the wrong foods - is driving higher rates of heart disease, diabetes and, most likely, some cancers. The pro-vegan campaign echos recent youth-driven movements around climate change, led in part by 16-year-old Swedish activist Greta Thunberg, whose call for action grabbed headlines at last month's World Economic Forum in Davos. Thunberg's appeals have sparked sporadic student strikes in Europe and the United States to highlight the urgent need to address global warming. The Million Dollar Vegan campaign is being led by the US-based Blue Horizon International Foundation, which pledged to put up the 878,000 euros if the pontiff says yes. 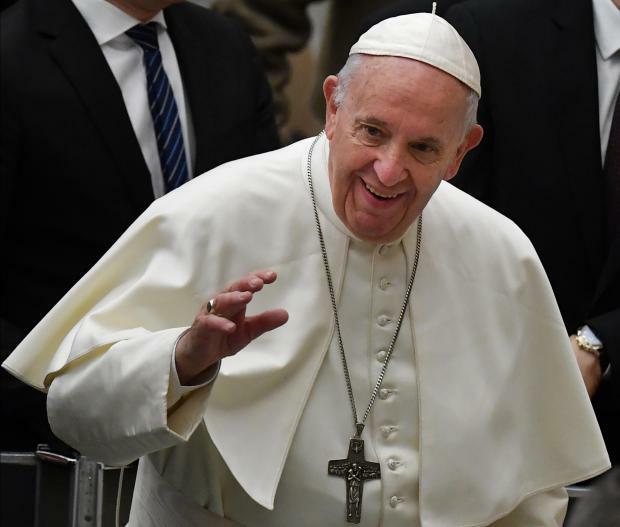 The organisers noted that Pope Francis' 2015 encyclical "Laudato Si" called for deep changes in lifestyle, production and consumption to restore nature and combat climate change.